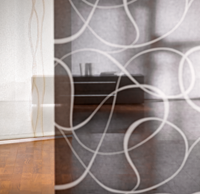 Panel blinds perfectly supplement reduced and puristic interior furnishings. They are particularly suitable for floor-to-ceiling windows and large window fronts, in order to dose the incidence of light there. This system can be equipped with a different number of panels, different panel widths and various hanging variants, entirely in accordance with the individual planning and architectural conditions. The technical system consists of an aluminium rail in which the fabric panels are guided. Each individual fabric panel can be removed easily for replacement or cleaning thanks to hook and loop tape technology. In this way the widest variety of effects can be achieved with the most diverse fabric transparencies or coordinated colours. In addition to their functional properties, panel blinds can decisively contribute to the overall stylistic statement of a room. Over 390 unis, decors and material structures, in four different transparency stages, function-orientated fabrics including Trevira CS, Perlex or aluminium rear-side coating, glass fibre, flame-resistance, suitability for PC workstations, dimout function, antibacterial equipment, suitability for wet rooms, noise protection function, Öko Tex Standard 100.